What are Planning and Zoning? Carl E. Peters take on issues of the day – mostly in New Jersey. The topics covered often include issues related to municipal engineering, zoning and land use, code enforcement , access for the disabled, dispute resolution and pending legislation or regulations. 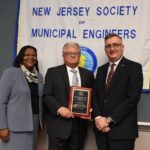 On Wednesday, November 16, 2016, Carl E. Peters, P.E., P.L.S, P.P, C.O received the New Jersey Society of Municipal Engineers (NJSME) award for distinguished service, Todd Hay, P.E., President of NJSME, presented the recognition at the society’s annual luncheon at the New Jersey State League of Municipalities Conference in Atlantic City. Peters, who is Past President of the statewide municipal engineering group, was honored for his: “Outstanding contribution as author of the NJSME ‘Analysis of NJ’s Municipal Road Repair Needs’ … and publishing the report as the State addressed TTF (Transportation Trust Fund) reform”. He is pictured at left with 2016 NJSME President Todd Hay, PE and incoming president Kimberli Craft, PE. Peters, who was the NJSME president in 2007, was the Municipal Engineer for the former Borough of Princeton from 1984 – 2007. He has remained active with the New Jersey Society of Municipal Engineers since leaving public employment. He has served on both the Executive Committee and Advisory Board and is also an instructor in the society’s Certified Municipal Engineer (CME) program. Peters provides training to professional engineers about New Jersey’s Municipal Land Use and Construction Code regulations. His class is part of a ten day program of courses developed by NJSME. The program’s mission is to educate engineers about the broad range of topics required to practice as a municipal engineer. Peters is currently in private practice with an office in Fords, NJ. He provides consulting services in the areas of land use, construction code analysis, handicapped (ADA) access and litigation support. Carl E. Peters, P.E., and co-authors Jonathan R. Peters, Ph.D. and Cameron Gordon, Ph.D. will be presenting their paper “Who should pay for the local street? Who does? A survey of New Jersey municipalities” at the annual meeting of the Transportation Research Board in Washington, DC, in January 2017. How Much Does It Cost to Maintain New Jersey’s Local Streets? The paper, which is based upon a study the team performed for the New Jersey Society of Municipal Engineers, quantifies the cost to keep New Jersey’s local streets in good repair. The report establishes the cost to maintain an average mile of a local street in New Jersey for a sixty year life span, It then projects the annual repair repair cost for all municipally maintained roads by multiplying the cost per mile by the total length of streets in municipal jurisdiction. The resulting annual need is a staggering $1.2 billion. 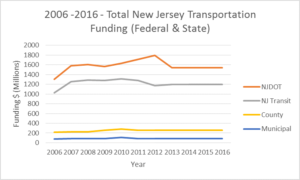 How is Transportation Funded in New Jersey? The paper includes an analysis of the current revenue sources available for the upkeep of municipal streets, along with State and County roadways and New Jersey Transit. The New Jersey Department of Transportation (NJDOT) 2010 listing of roadway mileage by jurisdiction shows that approximately 29,000 of the state’s 39,000 miles of roadway’s are maintained by municipalities. In 2014, State and Federal Aid to municipalities for local street repairs was less than $100 million. The remaining revenues to fix local streets must come from municipal budget sources, primarily property taxes. Are Current Funding Methods Fair? New Jersey Department of Transportation records indicate that in 2014 approximately 15% of average daily traffic was carried by local streets. The network of New Jersey’s municipal roads is extensive. Most vehicular trips have either an origin or destination on a local street. Local streets serve emergency services, commerce and other regional travel. Municipalities must maintain over 70% of New Jersey’s road mileage. These local streets carry over 15% of the vehicular trips per day. While noting that State and County roads are generally wider and carry larger volumes of truck traffic, it appears that New Jersey’s municipalities are being shortchanged when it comes to the distribution of funds for transportation. What does the future hold for funding of local street repairs? This paper has identified that we have much work to do to address efficient funding for local streets, sidewalks and curbs in particular. It is clear that the deferred maintenance and ongoing investment challenges are extensive and that the funding gap is massive. Yet these needs are largely ignored on the state and federal level; thus these costs and problems are left to the local governments. Like many state and federal unfunded mandates, the local governments then have to struggle to find funding sources to address problems that are not always just local in scope. Carl E. Peters will be attending the New Jersey League of Municipalities Conference in Atlantic City on Nov. 15 – 18, 2016 as a representative of the New Jersey Society of Municipal Engineers (NJSME) and the New Jersey Society of Professional Land Surveyors (NJSPLS). Peters is currently President-Elect of NJSPLS and a member of NJSME’s Executive Committee. On Tuesday afternoon Carl will be manning the NJSPLS booth #1803. Please stop by to discuss any land surveying questions that you have. On Wednesday, Carl will be participating in an assortment of NJSME functions including: the Past President’s breakfast, the annual business meeting, the awards luncheon. At 2:30, in Room 313, he will be attending a joint meeting of NJSME and the Institute of Local Government Attorneys – an annual program which always sparks a lively discussion. He will conclude the day ant the annual meeting of the NJ Planning Officials in Room 314. A discussion of Change Orders, Contract Closeout and Bid Documents will be held at 10:45 in Room 309 at a joint meeting of NJSME and the Governmental Purchasing Association of NJ. Please e-mail me at cpeters@carlepeters.com if you will be attending the conference and would like to chat. NJ Municipal Road Repairs – Where’s the Money? New Jersey’s municipalities need help. They’re in need of an adequate, steady source of funding for their road repairs. A recent report prepared for the New Jersey Society of Municipal Engineers estimates the annual need for municipal road repairs at almost $1.3 billion. New Jersey’s municipalities, who are constrained by a 2% tax cap, cannot adequately maintain their streets without both more funding from the Transportation Trust Fund (TTF) and a more equitable way of sharing those revenues with the counties. Unfortunately for Municipalities, they are at the end of the line when it comes to distribution of revenues from the Transportation Trust Fund. For the past ten years New Jersey Municipalities have received only about 3% of the state’s transportation funding (see graph below). This fact is especially troubling to local Mayors, Administrators and Engineers who are responsible for the maintenance of New Jersey’s more than 29,000 miles of municipal roadways representing 75% of the centerline road miles in the entire state. Local roads (county and municipal) carry over 50% of the traffic in New Jersey every day. Presumably, at least 50% of the fuel consumed in New Jersey is used while driving on local roads. Thus 50% of the fuel taxes are generated by vehicles travelling on local roads. Why isn’t 50% of the fuel tax revenue distributed to municipal and county governments to maintain their respective portions of New Jersey’s transportation network. Unfortunately, Governor Christie doesn’t believe that municipal and county governments are deserving of a share of the fuel taxes collected. Since 2009, annual allocations of $78.75 million each have been made for County and Municipal road repairs. The counties have also received $25 million annually for bridge maintenance (a task that is predominantly a county responsibility). Counties also get a much larger share of federal aid – $140 million annually, while municipalities get only $10 million annually. Unfortunately for municipal governments, this cost sharing formula does not reflect the actual cost to maintain New Jersey’s Municipal Road network. Ideally, municipal and county governments should receive sufficient state and federal funding so that the portion of road repair costs financed through property taxes is similar. While the ratio of Municipal to County Road Mileage is 4.56 to 1, the ratio of Municipal to County tax levies is only 1.64 to 1. County Freeholders, Engineers and Executives would likely argue that such an allocation of funds was unfair – since county roadways are often wider and carry greater daily traffic volumes than do municipal streets. Such factors increase construction costs and the needed frequency of road repairs. It may, therefore, be fairer to establish a method of sharing local aid that considers traffic loads as well as roadway length and also gives county roads a mileage bonus to account for their greater average width. In this alternative, each of these two components for the sharing of local aid – Traffic and Weighted Mileage is used to allocate one half of the local aid funds. Distribute fuel tax revenues evenly over roads that were used to generate them. 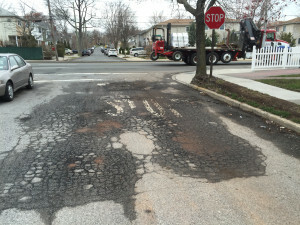 Posted in Municipal Engineering, New Jersey Issues, Uncategorized | Comments Off on NJ Municipal Road Repairs – Where’s the Money? NJ Infrastructure Maintenance – Who’s Responsible?, Immune?, Liable? As the snow melts, and we enter spring, it’s likely that Municipal Engineers will discover an array of problems to fix, within the boundaries of public streets – from huge potholes – to curbs, broken by errant snowplows – to cracked, spalled or heaved sidewalks. How do we prioritize the repairs and sort out who is responsible for making them? Undoubtedly, we want to correct the problems before someone gets hurt and the municipality we work for is sued. Infrastructure maintenance including pavements, drainage systems, curbs and sidewalks in public streets is an ongoing challenge for municipal engineers who are attempting to stretch their transportation funding while avoiding costly litigation. When an individual is injured within a New Jersey public right-of-way, The New Jersey Tort Claims Act, N.J.S.A. 59: 1-1 et seq., provides some immunity to local governments – that immunity is not absolute. A public entity is not liable for the exercise of discretion when, in the face of competing demands, it determines whether and how to utilize or apply existing resources, including those allocated for equipment, facilities and personnel unless a court concludes that the determination of the public entity was palpably unreasonable. Nothing in this section shall exonerate a public entity for negligence arising out of acts or omissions of its employees in carrying out their ministerial functions. Note that N.J.S.A. 59:2-1 requires that the entity make a determination about the allocation of limited resources and that the determination was not “palpably unreasonable”. In other words, obviously unwise, plainly absurd or patently foolish. What about a complete failure to act? Does a municipal entity have an obligation to understand what the competing demands for resources are – before allocating limited funding? I think, that a good argument could be made, that it does. Also note that immunity is not provided to a public entity for negligence arising out of the performance of “ministerial duties” – functions that demand no judgment or discretion. Is filling a pothole a ministerial function? How about replacing a missing stop sign or manhole cover? What about repairing a broken sidewalk or curb? a public entity had actual or constructive notice of the dangerous condition under section 59:4-3 a sufficient time prior to the injury to have taken measures to protect against the dangerous condition. Nothing in this section shall be construed to impose liability upon a public entity for a dangerous condition of its public property if the action the entity took to protect against the condition or the failure to take such action was not palpably unreasonable. So — how can municipalities behave to protect against the loss of protection provided by the Tort Claims Act? Next, – develop a method to prioritize the order of work. When considering who is responsible to maintain infrastructure within the public right of way, a few questions immediately come to mind. Whose right-of-way is it? – State? – County? – Municipal? – Other? What are the limits of jurisdiction at intersections? What part of the roadway is it? Does the abutting property owner have a responsibility? Who has an obligation to inspect for hazards? State?, County?, Municipality?, Property Owner?, Utility Company?, Other? What standard is used to determine if a defect is hazardous? Who determines if, and when, an observed defect should be fixed? I hope to explore these matters in more detail in future articles. Please provide me with your comments or suggestions about how to address these and other municipal engineering, code enforcement and alternative dispute resolution issues. Posted in The Peters Perspective | Comments Off on NJ Infrastructure Maintenance – Who’s Responsible?, Immune?, Liable? The United States Access Board has prepared computer animations to help designers understand the reasons for the standards that have been established for wheelchair maneuvering, wheelchair maneuvering at doorways, accessible toilet rooms and accessible bathing facilities. While it is important for designers of handicapped accessibility improvements to follow the code that is enforced in the jurisdictions of their projects, it’s often helpful to know why a regulation exists rather than simply following the letter of the code. I find this to be especially important when trying to retrofit existing buildings to make them accessible for wheelchair users. These videos can be also helpful for building owners who wish to improve the handicapped accessibility of their homes or businesses but are concerned about costs and don’t wish to embark on a project which is larger and more complicated than absolutely necessary. Building owners may also benefit by viewing these videos before performing maintenance on their premises. Often, changes made years after a new building has been approved and occupied (e.g. non-compliant faucets, door hardware, toilet paper and towel dispensers and objects places in required floor spaces) render it inaccessible. Owners of commercial buildings that fail to be in compliance with the standards set forth in the Americans with Disabilities Act are open to being sued and may be responsible to pay the costs of legal and expert witness fees along with the cost of fixing the problem. If you are interested in watching the computer animations prepared by the U.S. Access Board, simply click on the highlighted text. Please let me know if you find this information helpful. I’ve been pondering the differences between North Jersey, South Jersey and even Central Jersey for some time now. The more I look into the matter the more questions I have. It doesn’t seem enough just to identify regions and their differences but rather also to ask why the distinctions came to be. In my last post, “Possibly the Split is East Jersey,West Jersey, not North Jersey, South Jersey“,I discussed the origins of two Jerseys — East and West — during Colonial times. East Jersey related more to the Hudson River and New York, while West Jersey identified more with the Delaware River and Philadelphia. Transportation by water – especially the movement of goods – was essential to the development of the area. In the east, development thrived along the west bank of the Hudson River, Kill Van Kull and Arthur Kill. Camden, Trenton and Burlington grew along the east bank of the Delaware Bay (and River) from the Atlantic Ocean to the falls near Trenton where the river was not navigable. The population along the Atlantic shoreline was sparse due to the lack of safe harbors and anchorages for sailing vessels. It wasn’t until about the end of the first quarter of the 19th century that a maritime connection was made between the upper Delaware River and New York — the Morris Canal. At about the same time, the Delaware and Raritan Canal opened providing a shortcut between New York and Trenton and Philadelphia. Statistics for New Jersey Counties with a population density of less than 500 persons per square mile. One of the distinctions often made between North Jersey and South Jersey is that “North Jersey is more crowded”. While that may be true of some of the North Jersey counties, it’s not true for all. Some of the Counties that I have described as belonging to North Jersey have population densities that are remarkably similar to other counties in the most southern part of the state. It seemed to me that Jersey population trends warranted some looking into. I started by reviewing the New Jersey County Statistics that I had gathered for my first post “Where am I — North Jersey, South Jersey, or Possibly Even Central Jersey?” What I discovered was that some of the counties in North and Central Jersey had population densities as low or lower than those in the very southern portion of the state. The following table shows that seven counties have population densities of under 500 persons per square mile. So if the common wisdom “North Jersey is more densely populated than South Jersey” is not completely accurate, what else may we determine about New Jersey by the way its population has changed? What were the changes anyway? Luckily, I didn’t need to tabulate all of the New Jersey population data myself. I first came upon New Jersey Population Trends 1790 – 2010 — a nifty excel spreadsheet created by none other than the NJ Department of Labor. From this data I was able to develop the graphs below, which portray the New Jersey population changes by region and the regional changes by county. The first graph shows that the North Jersey population grew earlier than that of either South Jersey or Central Jersey, who maintained similar growth patterns until about 1860 (although the Central Jersey population was slightly higher), when Central Jersey’s growth rate increased at pace that has exceeded South Jersey through the latest census. North Jersey expanded the most quickly beginning in the mid-19th century and continuing until about 1960 when its population dipped for approximately twenty years. The North still leads in population but Central Jersey continues to narrow the gap. The second chart shows the regional trends in New Jersey population as a percentage of the total number of people living in the state. At the time of the first census the three regions claimed similar portions of the state’s residents – North and Central Jersey with approximately 35% and South Jersey with almost 30%. Almost immediately, North Jersey’s population took off while the South and Central Jersey shares of the pie declined. The disparity reached its peak in the early part of the 20th century when Central Jersey began to close the population gap. South Jersey has not kept pace with the other regions and now contains only 20% of the New Jersey population. That, of course doesn’t tell the complete story — growth within the regions was far from uniform — creating a need in me to develop additional graphs. The graphs that follow show changes in population by county from 1790 – 2010. I’ve grouped them by region in the hope that the display of information would be clearer. Please note that the county population data prior to the 1860 census is not completely accurate (sufficient, I believe, for this discussion), as it has not been adjusted for the following jurisdictional changes. Warren County was incorporated in November 1824, from portions of Sussex County. Atlantic County was created in February 1837, from portions of Gloucester County. Passaic County was created in February 1837, from portions of both Bergen County and Essex County. Mercer County was founded February 1838, from portions of surrounding counties. Hudson County was formed from Bergen in 1840. Camden County was formed in March 1844, from portions of Gloucester County. Ocean County was established in 1850 from portions of Monmouth County except for Little Egg Harbor Township which seceded from Burlington County in 1891. Union County was formed in March 1857, from portions of Essex County. I’ve left the evolution of the NJ County boundaries to be covered in a future post. The seven North Jersey counties all had small populations until about 1830 when Essex County’s growth rate began to rise more quickly than the rest. Hudson County took off in 1850, its development going stride for stride with Essex County until the turn of the 20th century when Essex surged ahead for good – late bloomer Bergen County surpassed Essex County in total population in 1980. Hudson County, whose growth potential was limited by being the smallest county in land area (47 sq. mi. ), remains on top of the list for highest population density (13,495 persons per sq. mi) having a density more than twice than of Essex County. Passaic County has grown quite steadily from the mid 19th century to the present while Morris County’s growth spurt waited until after World War II. By contrast, Sussex and Warren Counties have experienced a much lower increase in population than the rest of North Jersey. In Central Jersey, Midllesex, Mercer and Union Counties saw the earliest growth. Union County, part of Essex until 1857, took the lead in about 1900, to be surpassed by Middlesex County in about 1960. Monmouth County which had been in fourth place behind Mercer County moved up to third place in the early 1950’s and, in the 1970’s passed Union County for second place in Central Jersey. Ocean County’s growth started to skyrocket in the 1950’s bringing it into the third spot in 2010. As the largest county in area, Ocean still ranks in the bottom third of population density. Somerset and Hunterdon Counties have expanded at a more modest pace yet Somerset County has a population density similar to neighboring Morris County while Central Jersey’s Hunterdon County is as sparsely populated as Warren County in the North and Cumberland County far to the south. In the early 1800’s Burlington County was the South Jersey population leader – not surpassed by Camden County until the 1870’s. Today Camden County is the most populated of the South Jersey counties and has a density of almost twice that of runner-up GloucesterCounty. Atlantic County was quite sparsely populated until the late 1800’s. It currently has a population similar to that of Gloucester County, which did not see significant growth until the 1950’s. The most Southern Jersey Counties – Salem, Cumberland and Cape May have not experienced the population growth of the rest of the South Jersey region. In fact, Salem County’s population density of 196 persons per square mile is less than 70% of that of Sussex County, the second most sparsely populated county in New Jersey. Sources of power for industry? Proximity to New York and/or Philadelphia? In an upcoming post we’ll look at the development of one key municipality in each of the counties of New Jersey to see if we can find answers to some of these questions. I suspect that transportation resources in the form of ports, canals, railroads and highways will be the catalyst for growth in many regions while creating different patterns in each. New Jersey has been split since Colonial times – In fact, the splitting occurred precisely at the time this piece of geography became known as New Jersey. The great divide was not, however, between North Jersey and South Jersey; it was between East Jersey and West Jersey. In March 1664, King Charles II of of England deeded land, including the area that would become New Jersey, to his brother James Duke of York (who would later become King James II). James, in turn, made grants to his friends Sir George Carteret and John, Lord Berkeley – Carteret getting the East and Berkeley the West. The area that would become known as New Jersey in honor of Carteret’s defense of the Isle of Jersey in the English Channel. I stumbled upon this fact many years ago when I located a book in the bargain bin at the Rutgers University Book Store and made it mine for the sum of three dollars. This book The Story of New Jersey’s Civil Boundaries 1606 – 1968 by John P. Snyder was published by the Bureau of Geology and Topography in 1969. It was dedicated to the Land Surveyors of New Jersey by Robert A. Roe, Commissioner of the Department of Conservation and Economic Development (yes conservation and development were linked until 1970 when NJDEP came into being), who would eventually move on to Congress (and later have a federal building and a highway named for him). While this book languished on my bookshelves for many years and many moves I knew it would one day come in handy. While Mr. Snyder helped to launch me on my quest for the truth about these ancient New Jersey rivalries, I also found invaluable information from Rutgers University Library, the New Jersey State Archives, NOAA’s Historical Charts and Bob Barnett’s extremely informative website, westjersey.org. It seems that in March 1674, a mere ten years after receiving the grant, Lord Berkeley sold his half interest in New Jersey to John Fenwick who would in turn convey over nine tenths of West Jersey to a group headed by William Penn. In July 1674 the Duke of York issued a patent for East Jersey to Sir George Carteret which granted him the part of New Jersey north of a line connecting Barnegat Bay to Pennsauken Creek at the Delaware River- a line that would come into almost immediate dispute. Over in East Jersey in the 1660’s the Governor had been busy handing out patents – First for Elizabeth -Town ( Dec. 1664) which would quickly cut off Woodbridge which would split further to create Piscataway – later for Middletown and Shrewsbury (1665). In 1668 Bergen Township was chartered having begun its European existence as part of the Dutch settlement of New Amsterdam. By 1675 four counties had been created around the lines of development – these would be named Bergen, Essex, Middlesex and Monmouth in 1683. In 1676 Carteret entered into the Quintipartite Deed with the West Jersey Proprietors which established the boundary line between East Jersey and West Jersey as a line starting from the coast at Little Egg Harbor to the point on the Delaware River where it reaches 41 degrees 40 minutes latitude. The Duke of York confirmed this line with a deed to the West Jersey Proprietors in August 1680. It wasn’t until 1687 that anyone got around to establishing the line with a boundary survey. In that year George Keith, Surveyor General for East Jersey, ran the line from Little Egg Harbor to a point on the South Branch of the Raritan River, where he stopped – probably because there was already a dispute as to where the line was established on the ground. This line was eventually resurveyed in 1743 by John Lawrence, also a surveyor from East Jersey. The Keith Line remains the dividing line between Burlington County and Monmouth and Ocean Counties. For a brief period of time (1668 – 1695) Governors Daniel Coxe of West Jersey and Robert Barclay of East Jersey agreed upon a boundary that followed the Keith Line to the Raritan River and then meandered in a northeasterly direction to the New York border. This line, which placed Sussex and Morris Counties in West Jersey, was abolished by the colonial legislature in 1719. Of course in New Jersey nothing is easy. The dispute between East Jersey and West Jersey was complicated by the lack of agreement as to the location of the boundary between New York and New Jersey. In May 1719, a tripartite deed was signed by New York, East Jersey and West Jersey establishing the New York/ New Jersey line at a point more southerly on the Delaware River than New Jersey had claimed. Once the king’s commissioners completed the survey of the New York/New Jersey line in 1774, West Jersey looked to modify the East Jersey / West Jersey Line once again. That proposal was never adopted and the Lawrence line remained as the official dividing line between East Jersey and West Jersey. Of course the jurisdictional disputes between New York and New Jersey continued until the 1990’s when a disagreement about the status of Ellis Island was decided by the US Supreme Court. By 1775, development was greatest near the large navigable waterways. Ocean County didn’t exist in 1775 either and it’s a long sailboat ride to there from either New York or Philadelphia, anyway. So, for the moment I’m sticking by my proposition that there are three distinct regions of New Jersey — ,North South and Central but I’m beginning to see the merits of the argument that the state is split in two – but North Jersey/ South Jersey I’m not convinced. Sidewalk Repairs in New Jersey – Who gets the bill? Sidewalk Repairs are in the news. In its July 22, 2012 article “Amid slippery laws, towns take a stand on sidewalk repairs”, the Star Ledger reported about a program in Highland Park, NJ to require homeowners to repair defective walkways in front of their lots. Judging by the comments on NJ.com, the residents are incensed about being required to fix defective sidewalks. Scott Luthman, Highland Parks’s Construction Official, advised that approximately 1200 notices have been issued to repair cracked, settled, heaved or otherwise deteriorated sidewalks throughout the 1.9 square mile borough. This initiative was sparked by complaints from local residents, many of whom walk to worship services. According to Mr. Luthman, Highland Park offers to contract for the repairs and to bill the property owner for the actual costs incurred by the borough. Payments may be made over a five year period with a modest rate of interest applied to the bill. Commercial and residential property owners are treated alike. If the property owner chooses to select a contractor, the borough will provide a tree expert to alter street trees that are raising sidewalk slabs. So far, most residents are quietly conforming to the policy – there are, however about 15 to 20 property owners that are very unhappy and vocal. A similar tale is unfolding in Ridgewood where the Village has issued 160 notices to residents requiring them to repair sidewalks within 45 days. Much of the damage in Ridgewood is caused by trees planted in the grass strip between the curb and sidewalk. The property owners are being held accountable for repairing the sidewalks despite the fact that neither the trees or the sidewalk are on their property. Waldwick allows residents until the end of the year to make repairs and will consider giving extensions of time due to financial hardship. How some other municipalities approach sidewalk repair financing. Having been the Municipal Engineer for the Borough of Princeton for over twenty years, I understand the intensity of feeling often generated by requests of the municipality to have sidewalks repaired – or even worse installed where none existed before. The Princeton Borough Code also requires adjacent property owners to construct and maintain the sidewalks within the public right of way in front of their premises — including the removal of snow and ice. In the mid 1980’s, the Borough of Princeton developed a program that required the evaluation of all sidewalks within the limits of road construction and overlay projects. Repair of defective sidewalks was included in the scope of the borough’s capital projects. Property owners that elected to have their sidewalks replaced by the municipal contractor were assessed at 50% of the cost of the improvement, payable over a 5 – 10 year period. Persons opting to perform the work on their own were not offered a subsidy. Princeton Borough Engineer, Jack West reports that his office is currently administering an annual sidewalk repair program valued at over $120,000. This year’s program is primarily for the repair of walks damaged by municipal shade trees, These repairs are made at no cost to the adjacent property owner. Mr. West noted that the municipal ordinance allows his office to issue violation notices to property owners but only does so if a complaint initiated investigation reveals that the condition is very unsafe. Otherwise, repairs are made in conjunction with the borough’s capital road improvement program. Princeton Township Engineer, Robert Kiser reported a similar policy of assessing homeowners for 50% of sidewalk repair costs as part of a capital road project. The township does not assume the entire cost for repair of walks disturbed by street trees but does bear the cost of handicap accessibility improvements such as curb ramps and detectable warning strips. In nearby Lawrence Township, Municipal Engineer, James Parvese reported that property owners are given the opportunity to have their sidewalks replaced as part of a municipal project and make payments over time but are billed for 100% of the repair cost. According to Robert Vogel, Municipal Engineer, Madison Borough maintains the sidewalks in the Central Business District through a maintenance agreement with the New Jersey Department of Transportation for the sidewalk area on Route 124. Generally, Madison holds property owners responsible for sidewalk repairs but provides a 25% incentive when the work is performed as part of a municipal project, which they run every year. There is no charge for damage caused by a municipal shade tree or improvements made to remove barriers for the disabled. Freehold Township takes yet another approach. Township Engineer, Tim White outlined a novel incentive program which allows homeowners – not commercial properties – to request a 50% rebate from the township for sidewalk repairs they have performed by a contractor. Under this program, property owners must make application to the township prior to starting the work. The Township Engineer then inspects the property to determine if the repairs are necessary and that the damage has not been caused by the property owner’s negligence (such as allowing heavy equipment to pass over the sidewalk). To qualify for the reimbursement, the property owner must obtain a road opening permit, post a bond, have the work inspected and provide copies of the concrete delivery ticket and the contractor’s invoice. The town will then provide a 50% reimbursement up to a cost of $7/ sf for 4” thick walk and $9 / sf for 6” thick walk. Currently, an annual budget of approximately $25,000 is provided for this program. “Home Rule” prevails – one size doesn’t fit all in New Jersey. Policies in other municipalities range from: requiring property owners to make repairs based upon the results of housing or continued certificate of occupancy inspections to just not doing anything about sidewalks because they are the property owners problem. The most prevalent policy seems to be to direct the property owner to make the repair or have the municipality contract for the work and assess the owner for 100% of the cost. I’d like to know how this problem is addressed in your community. Please leave a comment. How did sidewalk installation and maintenance policies evolve in New Jersey? What regulations define where sidewalks are to be built and the standards of construction. Who’s liable for an injury occurring on the sidewalk in front of your property? – Does the answer to this question change if the property is residential, commercial, or non-profit? Do the sidewalk requirements in the NJ Residential Site Improvement Standards (RSIS) conform to those in the Public Rights of Way Accessibility Guidelines (PROWAG)? Will municipalities eliminate sidewalk repair subsidies in response to the 2% State mandated budget caps? Posted in Municipal Engineering, New Jersey Issues, Sidewalks in New Jersey, The Peters Perspective | Comments Off on Sidewalk Repairs in New Jersey – Who gets the bill? North, South or Central Jersey – What does the government say? North Jersey, South Jersey or Central Jersey – are governmental regulations needed? I’ve previously advanced the following proposal – There are three regions in New Jersey– North, South and Central Jersey, each containing seven counties. Also discussed was what some other people are saying. For example, of the people surveyed by Monmouth University/Gannett New Jersey almost half felt that Trenton Princeton and Red Bank were in South Jersey. Twenty Five to Twenty nine percent of this same group said Flemington and Lambertville were also in South Jersey (of course 28% of the people surveyed hadn’t heard of either of these towns). Since New Jerseyans seem so unclear about the location of these boundaries, I’ll need to look for answers from an authoritative source – the government. Now, we in New Jersey all know that the state government and sometimes the federal and local governments want to regulate almost every aspect of our daily lives. Certainly they must have created a statute or regulation that defines these regional boundaries. As an engineer, I have the privilege of working with many departments in the state bureaucracy – Transportation, Environmental Protection and Community Affairs to name a few. Starting with the Department of Transportation, we find that they have divided the state into three regions, North, South or Central Jersey. They agree with me about the South Jersey Region but have given Union County to North Jersey and reserved a small portion of Warren County for Central Jersey. Next we have three metropolitan transportation planning organizations – North Jersey Transportation Planning Authority (NJTPA), Delaware Valley Regional Planning Commission (DVRPC) and South Jersey Transportation Planning Organization (SJTPO), not North, South or Central Jersey as one would anticipate. These groups have a large say in how funds for transportation projects are distributed around the state. These groups seem to look at things very differently. NJTPA lays claim to 13 of the 14 counties that make up North and Central Jersey as I see it. SJTPO includes Cumberland, Atlantic, Cape May and Salem Counties but not Burlington, whose voters also opted for secession in a 1980 referrendum. I thought that only the most radical of South Jersey residents would strike the northerly border of their region at the south edge of Gloucester County. Even more curious is that Mercer, Burlington Camden and Gloucester Counties are lumped together with alien counties in Pennsylvania. The Department of State’s Division of Travel and Tourism has added more fuel to the fire by partitioning the state into six regions – as if the debate wasn’t heated enough already. These include the Skylands and Gateway in the north, the Delaware River and Jersey Shore Regions in the center and the Atlantic City and Southern Shore Region at the lower latitudes. The Department of Community Affairs Division of Codes and Standards develops and enforces the NJ Uniform Construction Code. They create different regions of the state for determining how to design buildings for wind loads, snow loads and radon gas. The NJDEP seems to look at things like geological and watershed zones. Both the NJDEP and NJDCA maps tend to create zone lines that run from the southwest to the northeast. This is getting a bit complicated. We better stick with Transportation and Tourism. Of course transportation in New Jersey means tolls – at least in my neck of the woods. Now what I’d really like is if I could find a map that shows which county’s residents pay the most in tolls. I’m pretty sure that those guys in the northwestern portion of the state are making out like bandits. After all. Passaic, Morris, Sussex, Warren, Hunterdon and Somerset Counties have no toll roads. How sweet is that? Posted in North Jersey vs. South Jersey, The Peters Perspective | Comments Off on North, South or Central Jersey – What does the government say?